US workers are quitting their jobs like crazy. On Thursday, the latest JOLTS report from the BLS showed that the quit rate for US workers rose to 2% in September, with total job quits rising to 2.8 million, a six-year high. And the read-through on quits is this: workers will quit their job if they are more confident they can find another one. Late last month, the Fed ended its quantitative easing program, starting the countdown to the Fed’s first interest rate hike since the financial crisis. In a note following that announcement, Chris Rupkey, chief financial economist at MUFG, wrote that the Fed’s statement implied it had “capitulated” and became willing to admit that there is real strength in the economy and the labour market, despite inflation that remains below the Fed’s 2% target. 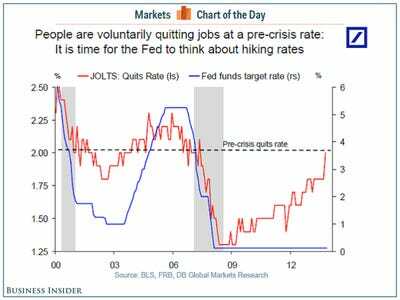 Torsten Slok, chief international economist at Deutsche Bank, also circulated a chart following the report that not only highlighted the quits rate, but Yellen’s prior emphasis on this figure. 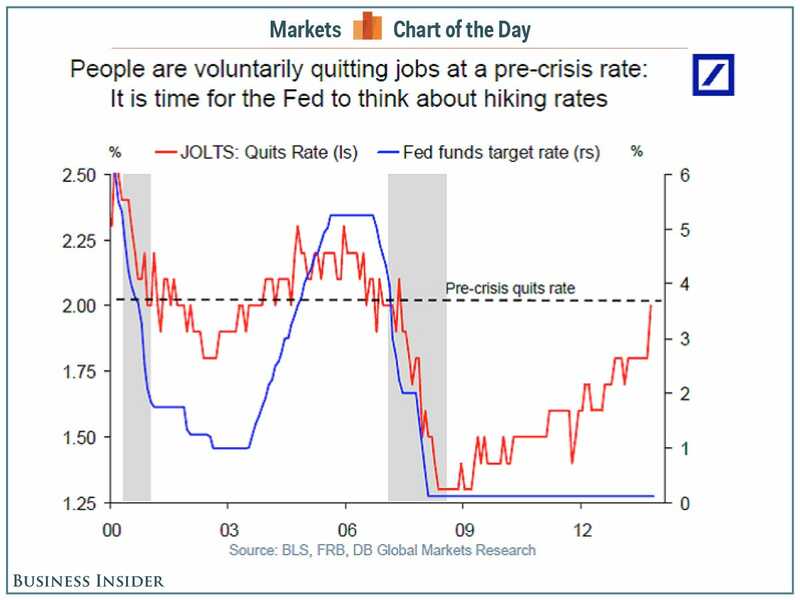 Slok’s chart shows the quit rate moving back to pre-crisis levels, and argues that this chart is the catalyst the Fed needs to begin raising rates.